I was so happy to see Susan Norwell last week. I heard from her about a new communication device that she thinks I should try. I want to be able to have more freedom to communicate with everyone I meet. Susan Norwell believes in me and others who struggle to communicate. She is my hero and I am so glad she came! I am going to try the Tango to see if it will help me visit easier with people. And in my study group to respond in my own voice. I would like to help the world have more compassion. It’s hard for those of us born with bodies that cause us so much trouble. It’s not something we chose. I feel compassion for those who get old and have limitations in their bodies that they cannot control. My step-grandpa is here with us because he wants to live with family nearby and I have never really spent time with him because he lived so far away. Now I am getting to see him as a frail, older man who has questions about who I am. I feel glad that we can help him. But it’s hard to know that at one time, he was able to care for himself and taught many people in school and in his church, and now feels like his life is so much less because he cannot do that anymore. I want to help him and others who see that their lives have changed so much. I want them to know that while we are alive we have purpose and we have opportunities that only we can do. It’s not good to lose that understanding, because we all need each other! We all need to have compassion and hope for a better world. It starts with us giving our hearts a job to do: to see others and to see the little things we can do. I hate it when I hear others think that the small kindnesses that we can show, don’t matter. That unless it’s big and in front of a group, or is impressive to someone, that it doesn’t matter. It’s not true!! It’s not true that our love and care for someone today, goes unnoticed. I have seen how thoughtful acts, help open hearts of someone who’s locked up inside their body. It’s important to help and hope and give. And that’s sorely lacking sometimes. I hope when you meet someone today, you see with your heart, that has compassion and sees how much you can do to bring light to someones heart. This is the second time Amy and Elizabeth have ever facilitated together. It worked great! Communication is one of the things I never stop thinking about. Yesterday Elizabeth came again and we had another wonderful time together. I asked her caregiver to assist my typing again and it worked great again. It worked well for Amy and Elizabeth too. I wanted to share this because people have been asking me again about how I learned to type and communicate my thoughts. It is something I have written about in How I Communicate. You can find it at the top of my blog. This is the second time Kristen and I had ever facilitated together. I love doing that with new people. When Elizabeth went home, Amy, Mom and I decided to write some more about the details of learning to facilitate typing with me. It was amazing how much information we had when we talked about it together. I wrote a lot of it and they added their information. We are planning on using it to teach my caregivers and friends how to assist me in communicating better. We want to have more people use my keyboard. It will help me so much and give my Mom a break. I know after having Kristen be able to do it really easily that it’s not impossible for others to learn it. But it’s been hard to describe how to do it. I think the information will help a lot. We will be making a video too. This is a poem I wrote today for my Mulberry Poets Group that meets on Thursdays. Thoughts formed without questions hurt many. This week I had something really wonderful happen to me and I want to share it with you. My friend Elizabeth who also has Rett Syndrome and communicates by typing too, came for another visit. We love being together! It’s so rare for me to be with another Rett girl who can communicate, so when we are together we have so much fun. I feel free with her. We were so close to the water, which we both love! We went to a lake near our house. Our mom’s went to pick blueberries so they were not with us, but a new person we just met to be a caregiver for me, went with us too. What she saw has never happened before with Elizabeth and me. We decided to switch facilitators so Elizabeth’s caregiver facilitated with me and I was able to type. That was the first time we did it together and that is a miracle, because many times when people see me type with Mom or Amy, they assume they could never do it, and stop trying. But when Kristen took my hand and helped me stop my movements I was able to type words for her. It was slower than Amy or my Mom and that is a miracle!! Then, Amy facilitated with Elizabeth and she typed for her too, immediately! I wanted to share this because both Elizabeth and I have struggled so much to type out our thoughts in our lifetimes and few people try to type with us, which makes us sad. It makes our Mom’s the only person everyday that we can type with, so whenever anyone wants us to respond, they run get our Mom’s and it has made them exhausted and us frustrated because we can type with more people who are interested in learning. When I was thinking about this today and think of all the people who have been in my life and have missed what I wanted to say because of their inability to help me communicate, I felt sad. But then I remembered Tuesday, and I remembered how happy Elizabeth and I were to be free to type for the first attempt at it with another person. I felt so much joy, because I know it is possible still for new people to help me communicate. I feel really hopeful that my new caregiver who was really interested in what happened will be able to type with me too. I stop and chew on my bandana while I am typing. I am visiting with my friend Barbara who produced my CD. My friend Ashley and I could type slowly together. She just moved to Chicago and I miss her so much. It was a miracle because Elizabeth holds her hand very different than I do. She has very strong fingers and holds them really straight and types very well right on the key with her left hand. I type with my right and curve my finger and use the side of it to touch the key. I fly over the keys really fast so my facilitator looks over my right shoulder to see the letters. We both move our heads while we are typing, because both of us can see better if we don’t stare straight at the keyboard, so we move a lot. Rett Syndrome doesn’t let us sit still very often. Elizabeth is always moving her body and I am always moving my hands. I stop to chew and fiddle by drumming with my left hand while I’m typing. I move my upper body forward and back all day long. I thought this is important because I have had so many therapists think if we aren’t looking straight at something that we are not paying attention. It’s not true, don’t believe that! We get everything. We see everything. Elizabeth and Kristen are coming again next week and we are going out on this boat again. We love being together near water. I was sharing my excitment with Amy just before we went on stage and my Mom read the message I had for the audience. (The Arc MN 2010 Annual Meeting) There were about 350 people there. I wanted to share our miracle and how fortunate we feel that this happened for us. Everyone was smiling!! Everyone felt hopeful. We were so thrilled!! My Mom says she wished she was there with the camera, but the blueberries are great! This is where I wrote this today. Beau was very curious about all the equipment. While I type my Mom reads my words into the recorder then she types them into my computer. I wrote this today for a group of parents who have daughters with Rett Syndrome. It might help some people so we are going to post it on my blog. My Mom has told me about this new group and that I could introduce myself when I was ready. Today is a good day and I am ready to tell you of my story. I hope that it helps you dream big dreams for your daughters who have Rett Syndrome. I am 26 years old. For most of my first 12 years we had never met anyone else who was like me. I didn’t understand what had happened to my body. It was a very hard life for many years. I suffered a lot of pain and I wasn’t given opportunities at school to show who I am inside. I lived with no way to communicate my needs or thoughts for 10 years. I was trying to tell my Mom and others around me that I was in here and wanted to be understood, but I couldn’t communicate that without extra help. I gave so much of my energy at that time. I was sad and scared and I cried a lot. 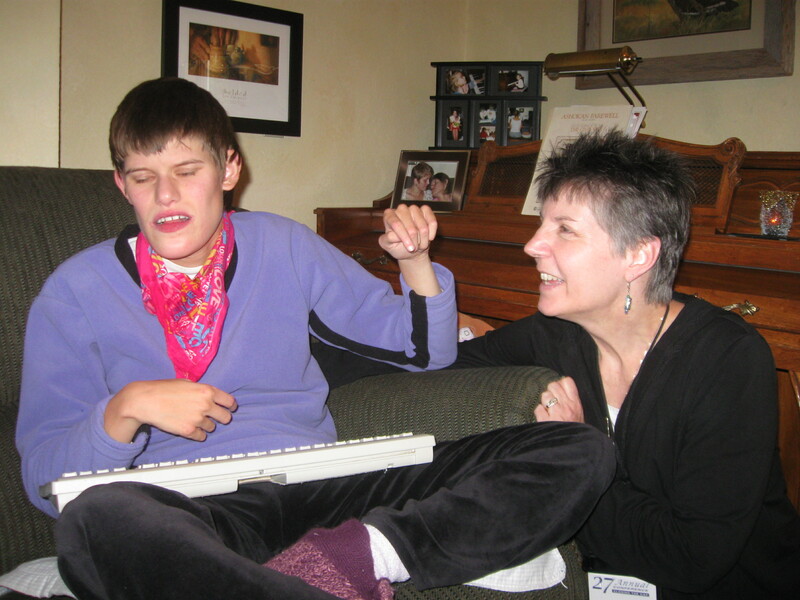 Since we had no idea about Rett Syndrome my Mom just kept trying everything she could think of. 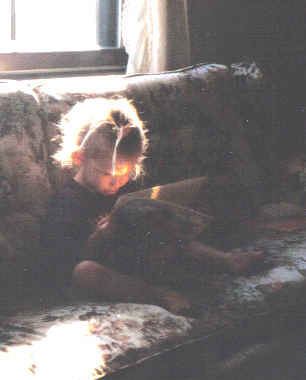 We read many books together with my sister who loves to read. We listened to books on tape, we listened to the radio and while my Mom played piano I sat on her lap and watched the keys. I loved music. We did this everyday until I was too big for my Mom to play around anymore. I haven’t had an easy life, but I have been surrounded by lots of love. My parents and sister are very musical and I was surrounded by many different kinds of music. I didn’t get much hope when I was in school but I got hope from my family. My mom believed in me and kept trying so many things to help me with my health and with my intelligence and with communication. When I was 10 years old my Mom and I read about a man who lived in an institution most of his life. We read it together and I remember sitting so close to the words and watching my mom read the mans story and how he was able as an adult at 36 years old, to begin typing. His family gave him a chance and he was able to leave the institution. He even wrote a book. 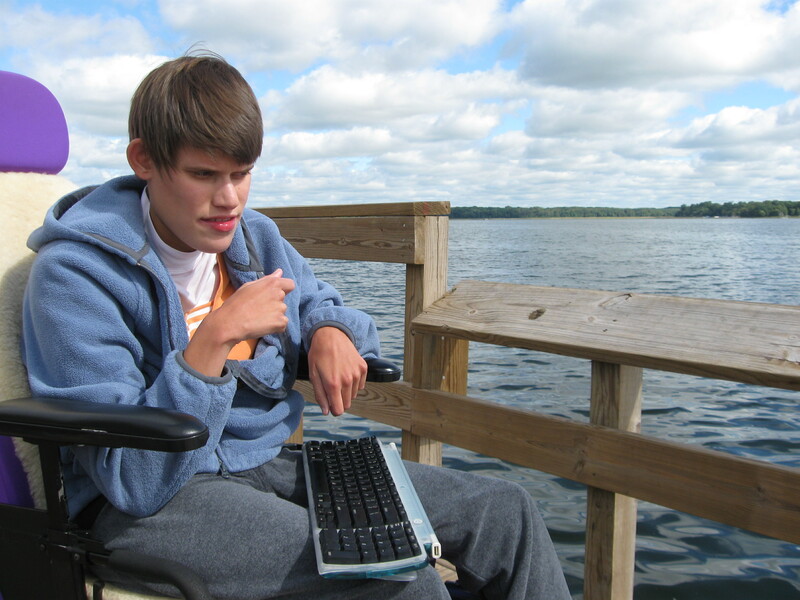 He needed help with his arm to type, because he couldn’t control much of his movements. But with the right kind of help, he showed that he was very intelligent and just waiting for someone to find out. I loved every word from his story! 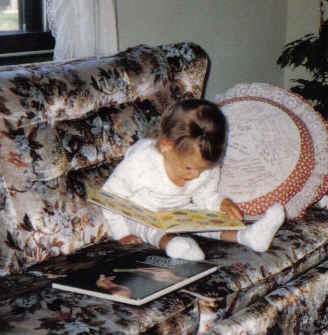 My Mom didn’t know at that time that I had taught myself how to read by sitting on her lap and looking at the words as she read for so many years, and I figured out how to spell most words. So by the time I was given a typewriter, by a woman who believed in people like me, I could type words. I typed very slow. Many times I couldn’t type no matter how hard I tried because of my movements that I couldn’t control. But today, if you see me typing, you will see that I type very fast. I have been so fortunate. Much of my life has changed so much. 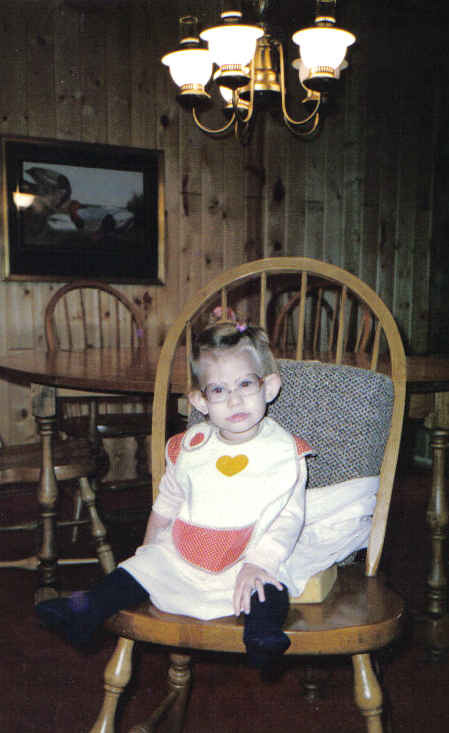 I still struggle everyday with Rett Syndrome. There are times I can’t feed myself, times when hyperventilation and breath holding make my days really hard, times when seizures stop me, times when I have terrible headaches, or frustration I can’t control and anxiety that makes me feel crazy inside. Nights when I can’t sleep. Days when I can’t stop chewing, but with all of this I have a blessed life. I have a life that has great times in it. I am a speaker at times. I have written for a magazine. I have my own CD of music I have composed for piano. 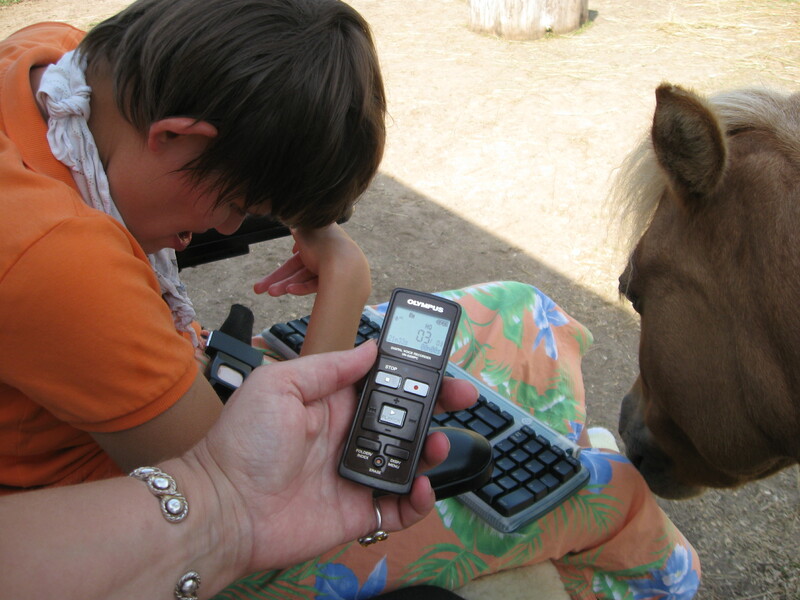 I am sitting here today with my miniature horse sleeping by my wheelchair. I have wonderful caregivers in my life, who have given me opportunities, because of their care for my body to be as healthy as I can be. I give them lots of credit because my family needs lots of help to care for me. So today I hope you hear my story and are inspired to believe in your daughters. Because if you do, they will show you who they are and what they are able to do. Don’t believe that the tests are a good indicator of their intellect because the tests I was given in school show that I am profoundly mentally impaired. It’s not true and those tests caused me much trouble in my life. I can’t show you my intellect but if you believe that I have it, you will change most of all because you will try many things to help me become the best person I can be. That was my Mom’s belief and it worked for us. I have not forgotten everyday the sacrifices and struggles we have had. Please don’t let Rett Syndrome be the only thing that is said of your daughter. It’s part of who I am but it’s not all that I am. I asked Susan Norwell if she would be willing to write something for me to put on my blogpage. 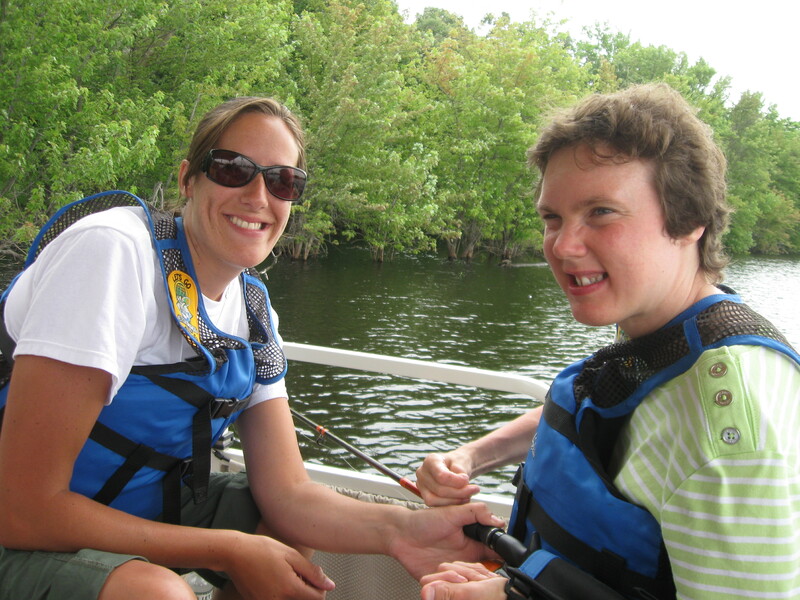 She has worked for many years with people who are challenged with communication. 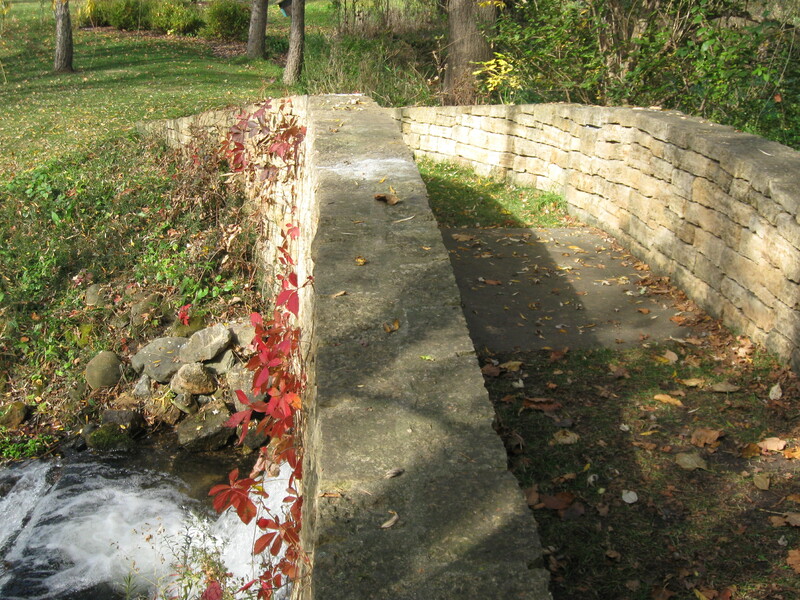 I had a great visit with her last Fall. She and I have written to each other by email since then. I am excited that she believes in Rett girls. We need people like her to believe in our intellect and not get stuck on our inability to express ourselves easily. 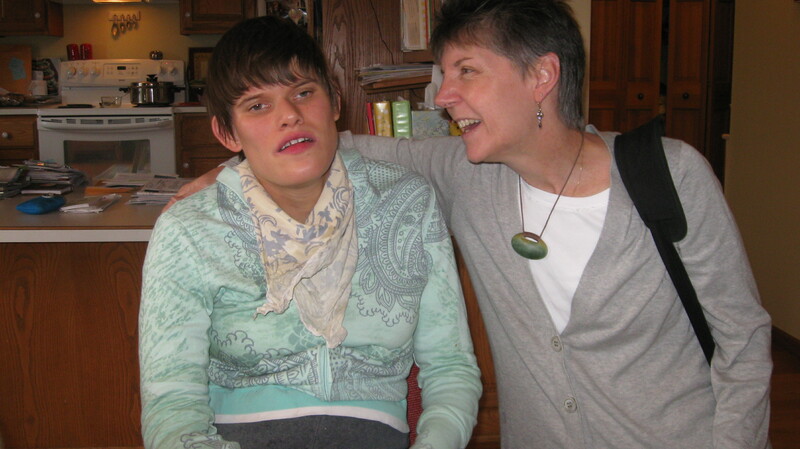 I have been working with girls/women with Rett for almost 30 years. They have all taught be so much, that I wish I could go back and help those first two babies I worked with in 1980. I would have a lot more to offer them now. What I have learned, most importantly, is that Rett is definitely a motor disorder and the motor deficits that are affecting cognition is what we should be concerned about. Instead, professionals dwell on the “apparent” cognitive deficit (evidenced by the lack of motor response) and tremendously undershoot these girls. I have lost count of the number of girls I have worked with, but this I know for sure….they are cognitively more capable than they are able to express and it is the lack of skill on our part that most hinders their development. So when I was asked to visit Karly to witness this young lady who was able to ‘Blog” and create music using FC, I was delighted and looking forward to learning something new from her. 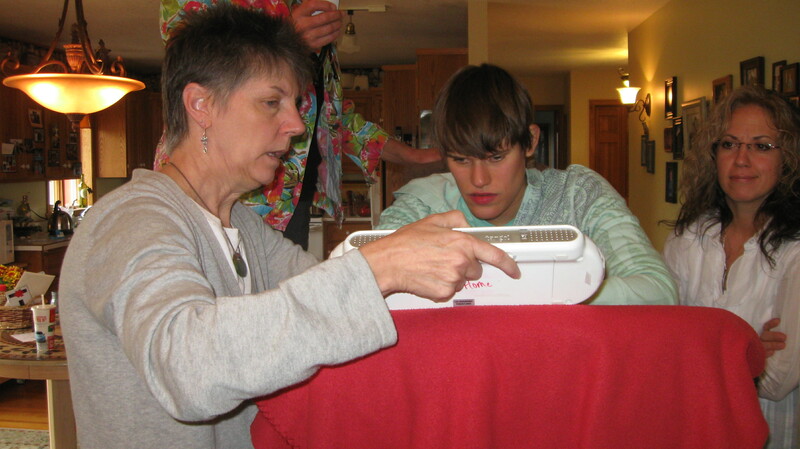 For years I have utilized Facilitated Communication with my students with autism. I was trained by the original Biklen, Syracuse crew back in the early 90’s. I work hard to decrease support as soon as possible and many of my students have “proved” the typing is theirs by reporting experiences I did not partake in and by continuing to provide correct answers even after I shield myself from their choices. I never want to influence a student as that would be a dishonest portrayal of their abilities and would be unfair to all involved. I currently use FC with a young woman with Rett, who types more slowly than Karly, but clearly expresses her ideas and intentions using an AAC device called the tango! Karly communicated via a keyboard facilitated by her mom. She was able to answer my questions and make appropriate comments throughout our visit. Her communication would sometimes halt as she lost the motor plan. In my professional opinion, this proved to validate her communication as those stops are consistent with the disorder. Karly had wonderful insights, a great sense of humor and spoke in a manner that is more like writing than typical speech. This is again something I have noticed with other students who use FC. They typically don’t use the slang we all do and are more precise in their communication, which is more similar to how we communicate in writing. I have been in a strange place these past few days. I was so content for many days without any hyperventilating or breath holding and now I can’t stop either of them. I am frustrated about that! But, my mood is good and I feel happy inside, even though I am struggling to breathe. I wanted to write about that because for the past two days I have had important things happen. One of them was a meeting I was so excited about for a long time. I will write about that some other time, but because I was so hyper and struggling with breath holding, I felt really embarrassed. I usually don’t have that feeling, but I really wanted to hear what was being said and I was so restless, it was distracting. I hate that! It’s hard to have my body do what it wants, even when my mind is screaming no! I was suppose to go to my women’s study group today, but because of my restless body I decided it would be too hard for me to be there. It’s even more hard when the room is quiet and the only sounds are a person’s voice and the sound of me hyperventilating. Since it has been beautiful here this week I have been getting outside some, but it’s still a little cool. So, today and yesterday, my Mom and I went for long drives around the country and saw some beautiful areas. I have chosen a bunch of books for my Ipod that my sister Leah got for me. While we were driving we listened to one of my books, and I just finished it today. I felt so inspired by it. It was written by Chris Tomlin, who is a musician and worship leader. He shared his story of how he began playing music and how much he always loved to sing and perform. I think the best part for me was to hear him share his struggles and to hear him say how hard it was when he started singing for people. The title is: The Way I was Made. He knew that he loved music and was passionate about worshipping, so he kept praying for a life where he could do that. I heard him say to not forget, each one of us was created for something special. And even if we have many challenges in our lives, we are unique and our purpose is different from anyone else. We don’t need to be the same as anyone else! We are not created to be copies of other people, but to become who we were created to be. I needed to be reminded of this today, because as I struggle with my body and the embarrassment I feel sometimes, being with normal people, I realized that God knows me best and He isn’t embarrassed of me. Even if I do things that are distracting to others, God knows my heart and how much I want to be free from these struggles. Maybe my weakness is the thing that can be the most help to others. Chris Tomlin said that many times he has seen how God doesn’t use the things that we are strongest in to help other people, but the things that are our biggest challenge. I was helped by this today. We drove by this waterfall today. It's too muddy to get close yet, but I'm eager to do that soon. Me with a book. Sometimes I could get my hands to work for a short while. 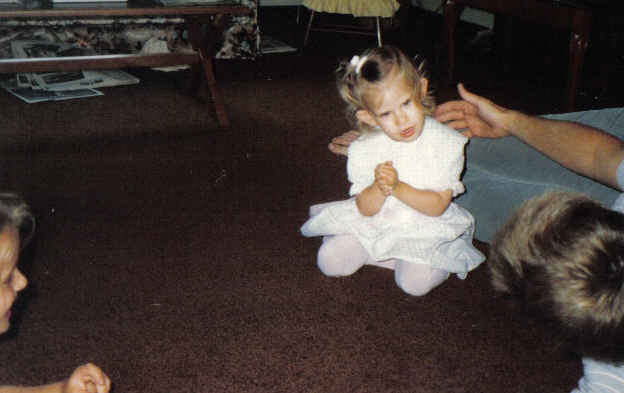 I have been thinking some more about my memories from my childhood. 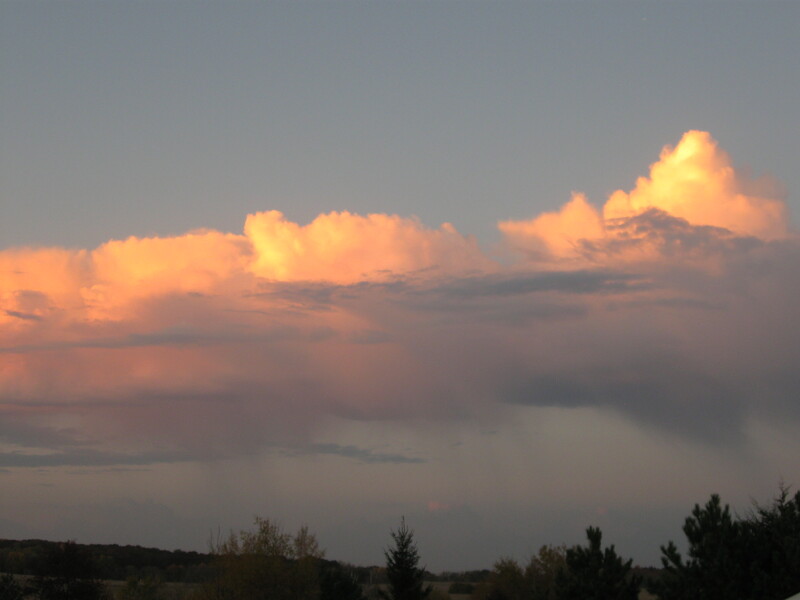 I was so tired after I wrote my last memory blog, that I slept for a long time that night. It makes me glad for where I am now in my life, but it is hard to remember the life I had before. It wasn’t because of my family. They loved me and most of them believed in me, but it was schools and doctors and therapists and people in general that have given me the most sadness. 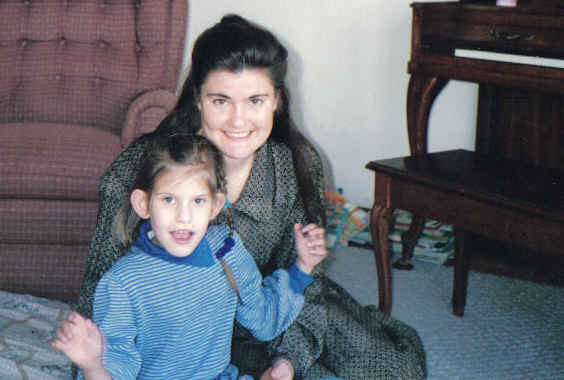 I couldn’t imagine doing what I am now even five years ago, so I want to write about my child days because there are many other girls with Rett who can’t imagine their life being worth living sometimes. I haven’t always had so many wonderful things happening in my life as I do now, but it’s because of the willingness of my family, especially my Mom to keep on trying, to keep on believing in me, that things changed. I have said so many prayers asking for a way to help others, a way that was believable. My Mom says I always looked closely at letters and numbers from the time I was a small baby. I want to write today about how I was trying to communicate with others before my keyboard. I had no method to communicate until I was ten. My Mom saw things in me that made her believe I was intelligent and that I needed a way to express myself, but she couldn’t get the schools to agree. Since they had all the speech therapists they made many decisions. They made decisions that kept me locked up inside my body. I went to see a team of therapists to work on a communication system for me before I was ten. We had over 20 visits at a hospital. They were trying to help me but because Rett Syndrome has a mind of its own, I couldn’t show them each time that I went there, that I could independently touch buttons or a keyboard or a screen. On my good days when my movement was more controlled, I could do really well, but they needed more proof for us to get the money to buy the equipment. Even with my best days, it was really hard for me to touch the screen just right. I was screaming inside. I knew what they were thinking. I heard what they said. I gave them my best efforts to show them I was in here, but it didn’t happen. Even after all the appointments and all the trials I still didn’t have anything I could use. I know the therapist was trying which was different than what I got at school, but I felt so lost. 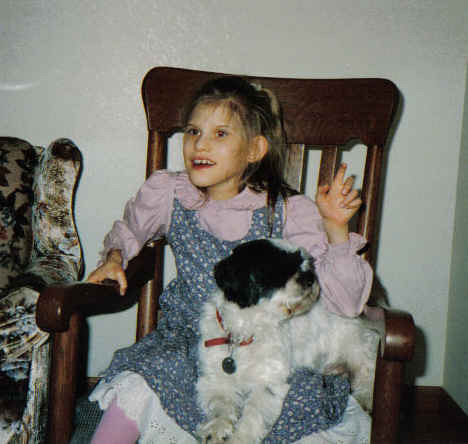 This was before I had a diagnosis of Rett Syndrome. I doubt that it would have helped me for them to know what I have. I have written about this on my communication page. 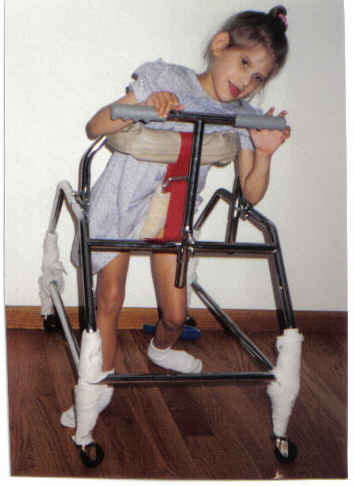 My first walker. I couldn't walk much but I could stand for a while. I just wanted to say here that if others had believed in my intellect when they did their evaluations, I would have felt more calm. But because I was stressed hearing what they were saying and how they assumed I was a small child in my mind, it made me want to cry. Instead of being free I was stuck trying to show them I was capable, and that it was just my body that was not working for me. When I am stressed I do more chewing, so my hands are constantly grabbing for my bandana or whatever I can reach to chew on, and I hyperventilate more. It’s hard to focus when I’m hyperventilating. It’s not something I’ve been able to control. Just thinking about those days is making me do more chewing, drumming and hyperventilating as I write this. It’s hard for me to type without lots of stopping. I don’t like it!! It’s hard for my mom or any other person trying to facilitate my typing. The more stressed I get, the more I hold my breath, so I am going to quit today. 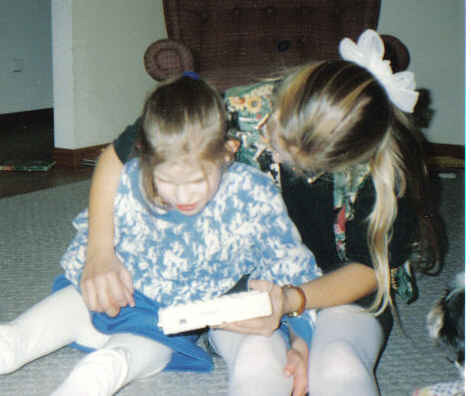 But I wanted to share this memory because I know other people who have Rett Syndrome struggle with these things too. It was a great Thanksgiving. I had just been given a way to communicate that worked for me. I was thrilled. My life changed in one day! This was at my grandparents cabin when I was 18 months old. Orange is my favorite color. I haven’t been writing much this time of year. 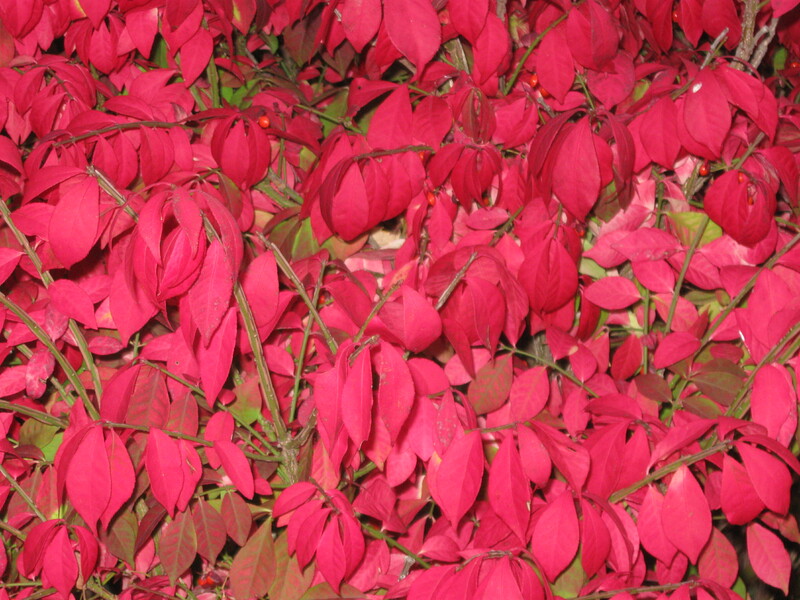 I enjoy being outdoors and I love the leaves that are turning many beautiful colors. I can’t see them unless I am close but I can see their colors. 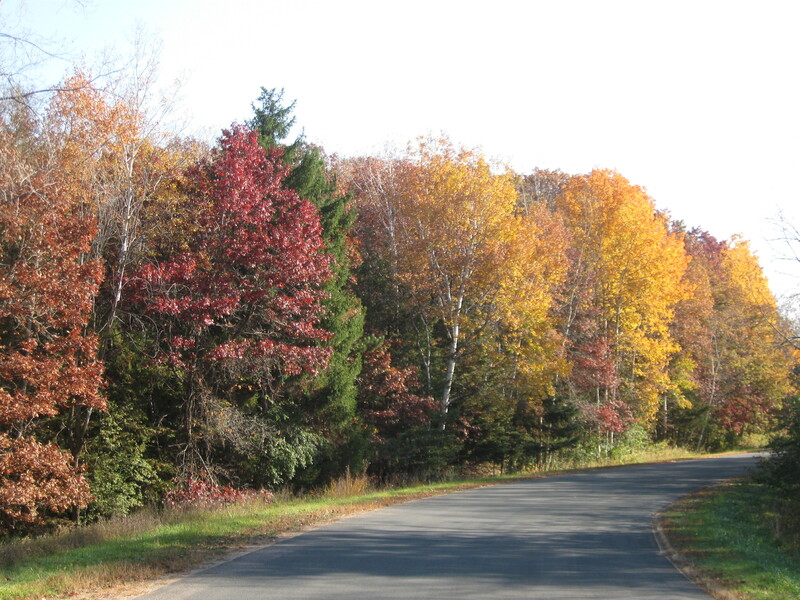 My Mom and I have been going on drives and using my Flip Video camera to record the leaves changing colors. It’s been great to watch those videos on my new computer. One of the things that I love is being near water. It makes me feel so peaceful. I don’t hold my breath or hyperventilate as much near water. I live in a state where there are thousands of lakes and rivers and ponds, so I can be close to water in the warm months. But when it is cold I can’t be outside, because my body can’t handle the cold. I can’t stay warm then. We decided this summer to video water so I could watch it during the winter. My Mom has gotten about 12 different videos for me to watch of water. 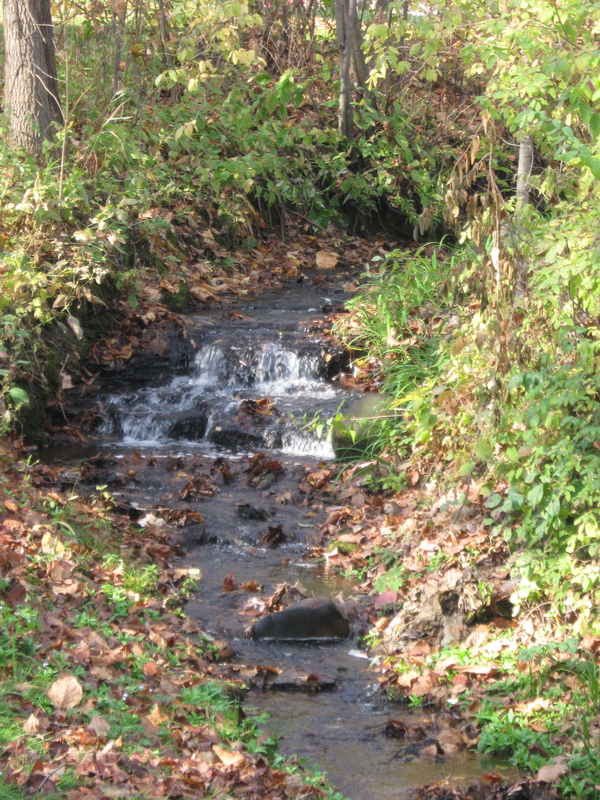 Some of it is calm and peaceful and others are waterfalls that I need on days when I am hyper. I have had a hard time with my anxiety. I feel so restless. In the Rettgirl brochure they talk about Rett Syndrome being a combination of five disorders. Parkinson’s Disease, Epilepsy, Autism, Cerebral Palsy and Anxiety Disorder. Many days I feel calm, but lately I have felt so anxious that I can’t relax. I sleep good, but I feel so hyper in my body and mind during the day. I hate days that feel like that, because I don’t feel like writing, or being around people. I even have shredded my bandanas with teeth. I feel so frustrated that I can’t just calm down. We have done many things that have become difficult to manage like exercising in my walker, and standing an hour everyday, and going for drives and being outside listening to calming music and being in my swing. I want it to stop because it’s not me in my mind, it’s what my body does that I can’t help. If there was a cure for this part of Rett Syndrome I would be very happy. 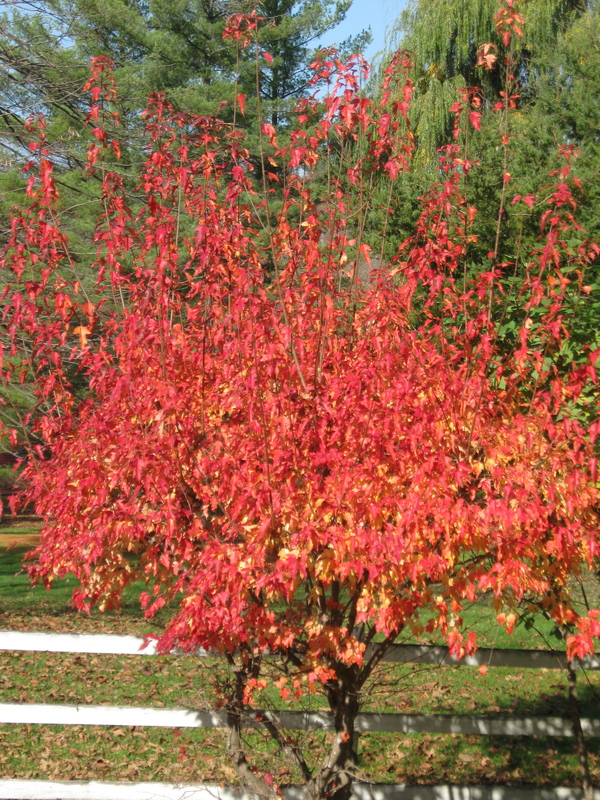 Here are some pictures of our state in the Fall. Our friend Theresa helped push my chair to the bridge. We had a picnic by the waterfall. This bush is right beside our deck. Sitting on the dock by one of my favorite lakes. Being near water calms me. This is so beautiful! I can see it on my computer after my Mom takes the picture.